Fairtrade Fortnight this year probably had more events taking place in Winchester than on any previous year. 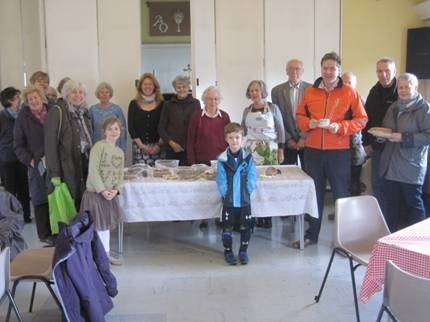 Tuesday 28 February was Shrove Tuesday, and the United Church in Jewry Street served pancakes between 3.30 and 6.30; fairtrade ingredients were used for pancakes and toppings, and the Fairtrade stall was open. 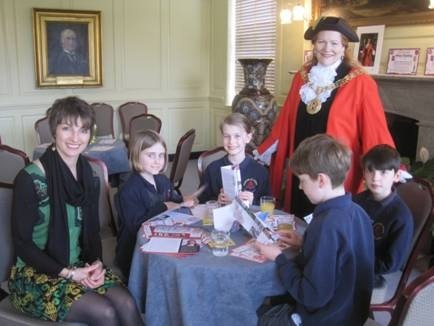 On Friday afternoon, 3 March, from 2.30 to 4.30 the Mayor of Winchester, Councillor Jane Rutter, was ‘at home’ at Abbey House in the Broadway, and visitors were given fairtrade tea and cakes. 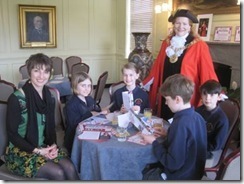 There was also the chance to win a hamper filled with fairtrade goods. Saturday 4 March was the busiest day of the Fortnight. 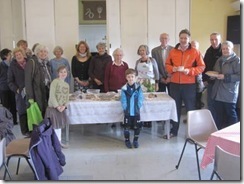 It started in the morning with a Big Brew at St Mark’s, Oliver’s Battery, from 10.00 to 12.00, when there was an opportunity to consume yet more fairtrade cakes and biscuits – and buy some to take home from the cake stall. Steve Brine, our local MP, came to this event with his two children, and thanks to him there was a group photograph from the event in the Chronicle and the Observer! Half an hour after this finished there was to have been a talk in the St Peter’s Pastoral Centre on Fairtrade for Palestinian Farmers. However, the speaker, Taysir Arbasi, the Director of the company Zaytoun, which works with olive growers in the West Bank, helping them to export their produce under Fairtrade terms, was taken ill the evening before the talk was due to take place and was unable to come. Those who came to hear him had an enjoyable couple of hours chatting and eating Palestinian bread dipped in Zaytoun olive oil. And that was not all for the Saturday! That evening, from 6.30 to 9.30 the University of Winchester students put on a most entertaining Fairtrade Fashion Show at the University where all the clothes modelled were donated, and raffled at the end!. To round off the Fortnight there was another Big Brew on Saturday 11 March in Springvale Road, King’s Worthy.